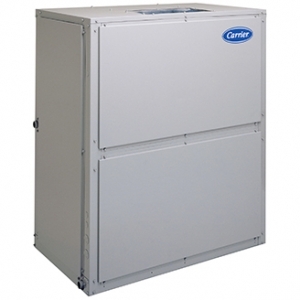 The Gemini™ 40RUS indoor air handler contains a chilled water coil and may be interfaced into chilled water systems. The 40RU series have a multi-position design that allows for vertical or horizontal installation with no modifications. Powerful fan systems allow easy adaptation to existing ductwork. For heating capability, the 40RU’s allow for field installed electric heaters, hot water coils, or steam coils. HVAC – Heating – Air Conditioning Repair Experts at Perryaire. Copyright 2015 Perryairecarrier.com • Providing Carrier HVAC • Heating • Cooling • Air Conditioning products nationwide. Call us today 703-521-2226!